Kai Ashimoto is depressed. His parents have divorced and now he finds himself in Hinashi Town, a fishing village far from Tokyo, living with his father and grouchy grandfather, an umbrella maker. The only thing that matters to Kai is his music, so when two of his new schoolmates, red-haired Yuho and priest’s son Yukino invite him to join their band SEIRÈN, he reluctantly agrees. 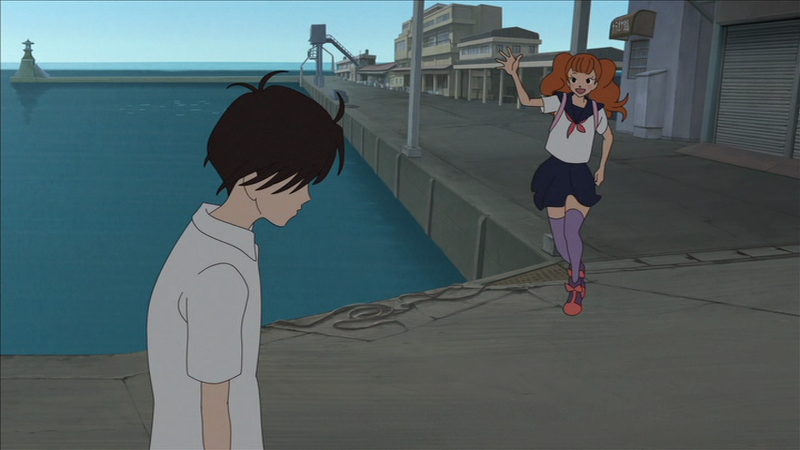 They go out to practise at the abandoned amusement park on Merfolk Island – and as soon as they start to play Kai’s song, a strange little girl appears and starts singing and dancing with infectious enthusiasm. Lu is a mermaid and she wants to be friends; whenever the music begins, her tail transforms into legs, so she can dance, and then some! Contact with Lu begins to work a change in Kai, lifting his depression and giving his life new meaning. But there is bad blood between the people of Hinashi Town and the merfolk who live in the gloom cast by the Shadowstone (Lu and her kind will burn if exposed to bright sunlight). Kai’s grandfather lost his mother when she was bitten by one of the merfolk and disappeared into the sea. However, after Lu is shown singing and dancing on social media, Yuho’s enterprising grandfather – always one with an eye for a commercial scheme – decides to use Lu to rebuild the amusement park, and have a grand opening, featuring SEIRÈN. When things inevitably go wrong, it’s down to the young people to counteract the greed of the townsfolk and their fear of the merfolk and get everyone to work together to prevent a terrible disaster. This is a great film to watch as a pick-me-up if you’re feeling down; it radiates an infectiously joyous quality that’s irresistible. 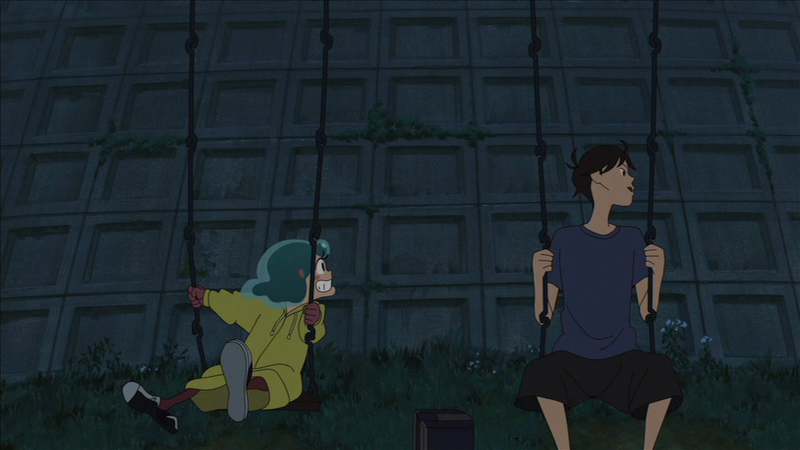 And – unlike Masaaki Yuasa’s other animations – it has a PG rating, so it’s also one you can watch with the family. If it shares one or two superficial similarities with Ponyo on a Cliff, that honestly doesn’t bother me (frankly I’m not a great fan of that late Ghibli outing) – if anything, I prefer Lu. There are moments of mischievous humour, as in the sequence when Lu’s father arrives to help out at the fish-processing plant. 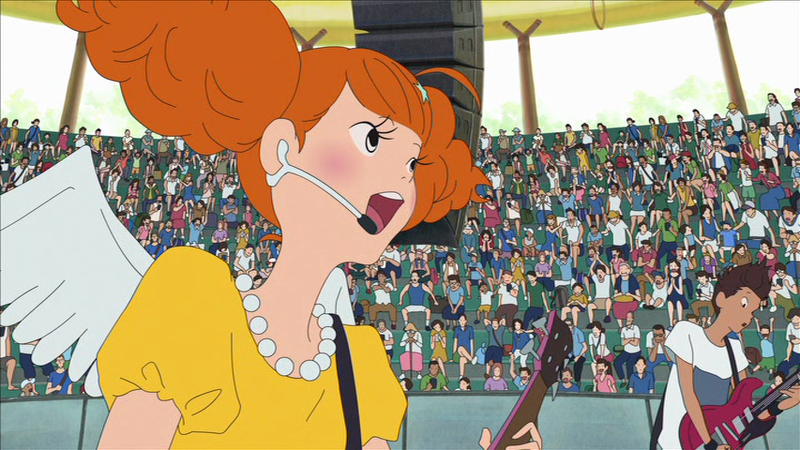 Yuasa matches music to animation in the fluid and creative way that is uniquely his own, in this instance showing how the wild child Lu makes everyone’s lives happier through her spontaneous reaction to Kai’s songs. He and his team use Flash (or, more accurately, a fusion of traditionally drawn frames animated with Flash which allows the synchronization of the moving images to the rhythm of the music) and has mentioned in interview the influence on his work of Tex Avery, Disney, and Tom and Jerry cartoons. It’s hard not to prefer the voice acting of the original cast as the story is so rooted in the world of a small Japanese fishing community and Kanon Tani is just right as Lu. Her US counterpart, Christine Marie Cabanos, makes for a good second-best and it has to be said that the US voice actor for Kai, Michael Sinterniklaas, does a better job when singing than original actor Shouta Shimoda, although this appears to be Shimoda’s first anime, so perhaps he’s not far in age from Kai. Music is the means of communication – and restorer of harmony – between land and sea and music often plays a highly significant role in Yuasa’s work, as shown in the recent film Night is Short, Walk on Girl and controversial TV series Devilman Crybaby. The catchy, toe-tapping soundtrack has been composed by versatile Takatsugu Murumatsu (When Marnie Was There, Mary and the Witch’s Flower) although ‘Kai’s’ song (and the ED) “Utautai no Ballad” is by Kazuyoshi Saitou. The Blu-ray is easy to navigate and the sound and picture quality is excellent (although if you’re watching the US dub, the volume needs turning right up). However, the subtitles are in white, which causes some problems for viewers (like me) whose sight is not 100%; a strong black border, a background panel or another colour, like yellow, would make them much easier to read. 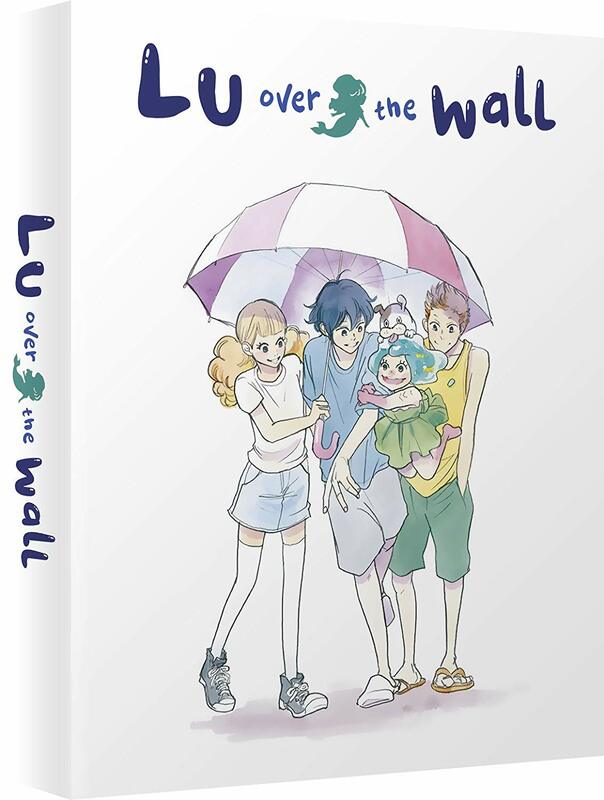 Lu Over the Wall is a riotously exuberant watch with an engaging blend of music and colourful, fluid animation. And it’s good to have another anime film that can be shared with younger viewers. You can also read our reviewer Demelza’s thoughts about this film when it was first given a theatrical release in the UK last year. 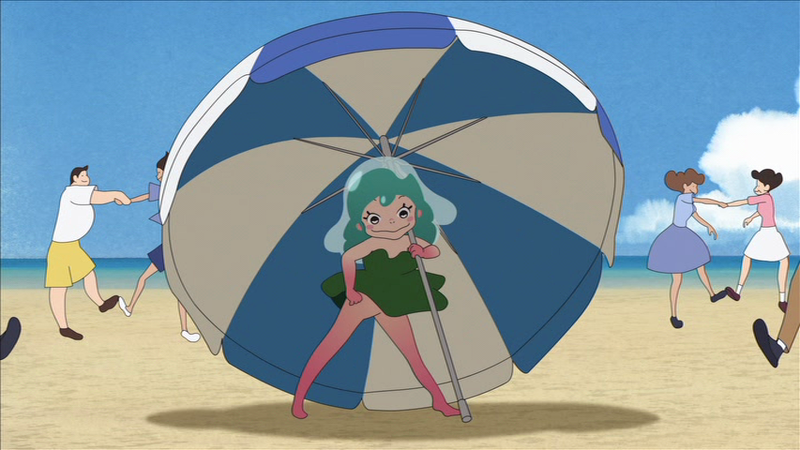 TOHO confirms summer Japanese theatrical release for the latest film from Lu over the Wall’s Masaaki Yuasa, romantic comedy “Kimi to, Nami ni Noretara”!